Looking for a convenient way to reach more people with your next mobile message? 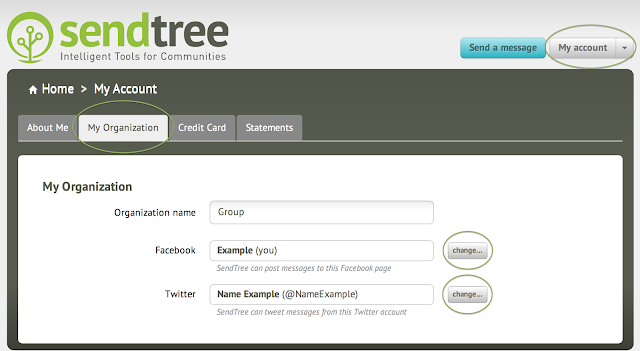 With SendTree you can automatically post a message to your Facebook and Twitter. Just follow these steps to complete this one-time configuration process and start posting on your Facebook and Twitter today! Select the “My Account” button and then the "My Organization" tab. Configure – Now you’ll need to take a moment to connect your Facebook and Twitter pages to your SendTree Account. To connect your SendTree and Facebook begin by clicking the "My Account" button after you've logged into SendTree. Then navigate to the "My Organization" tab. 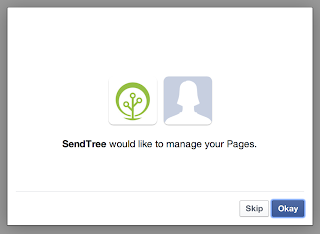 Once on the "My Organization" page you’ll see a blue button that says “Let SendTree Post to Facebook…" Click that button. Log in like you normally would to Facebook. 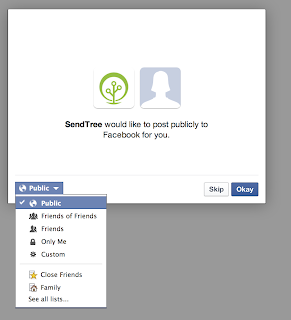 Step 1: The set up process begins with Facebook informing you that SendTree will receive your public profile and friends list. 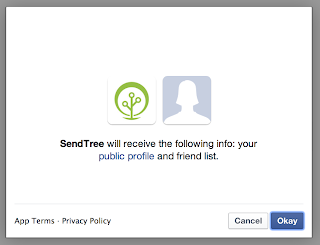 This is a formality and ensures you are aware SendTree is attempting to connect to your Facebook. Simply select “Okay” for this part. 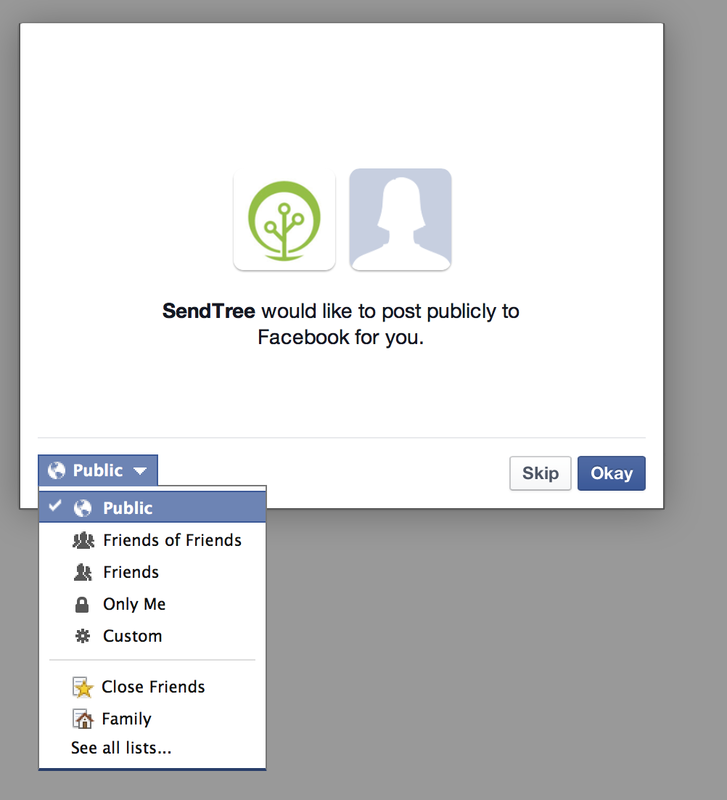 Step 2: Next, SendTree will ask for your permission to post publicly on your Facebook. Select “Okay” if you’d like your posts to be public OR if you’d like to customize who will view your posts, you can manage this list by clicking the drop-down tab that reads “Public”. Several group options should appear and you can customize who will see your messages that way. Once you’ve decided which groups will receive your messages click “Okay”. 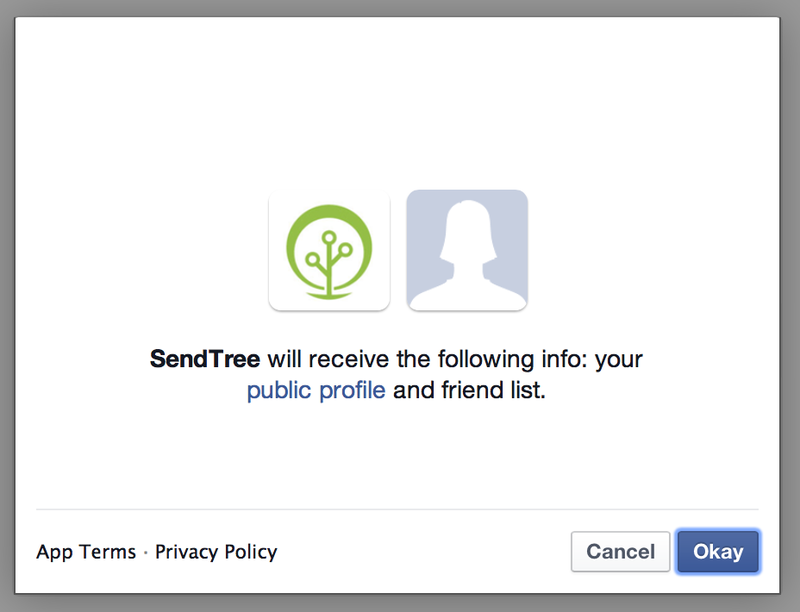 Step 2: Select "Okay" or customize your lists and then select "Okay"
Step 3: Facebook will then notify you that SendTree will now be a member of your Facebook Pages. 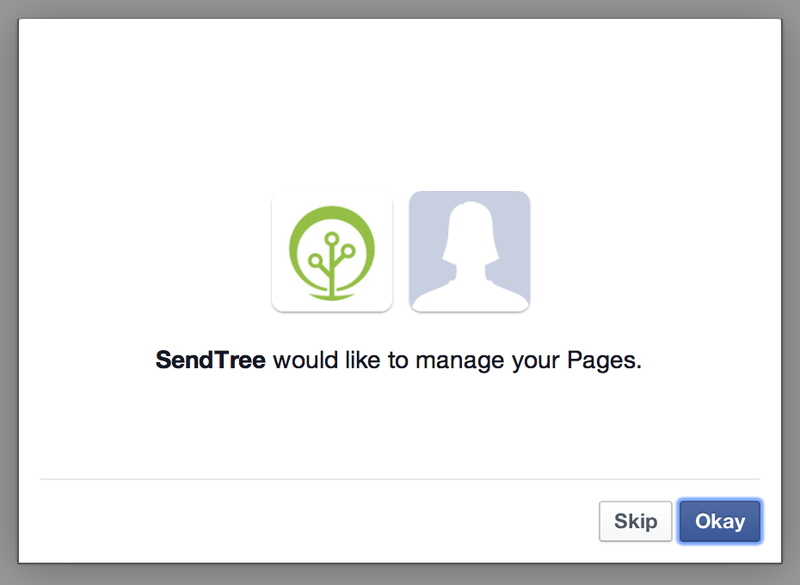 This step establishes your SendTree account is now connected to Facebook. To finish this process select, “Okay”. Step 3: Select "Okay" one more time. Step 4: To complete this process you'll need to save these settings on your SendTree account. Again, you'll need to navigate to the "My Organization" page under "My Account". Select the circle beside your Facebook account and click "Save". Highlight the circle beside your Facebook and click "Save"
To connect your SendTree and Twitter begin by clicking the "My Account" button after you've logged into SendTree. Then navigate to the "My Organization" tab. 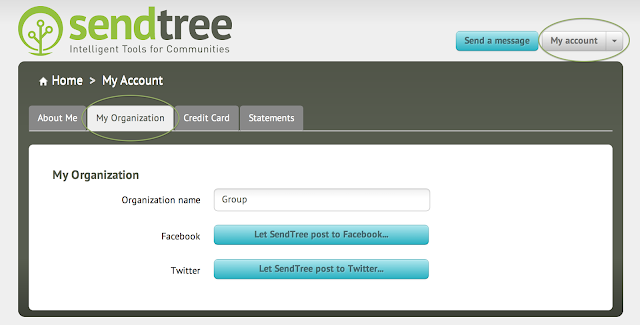 Once on the "My Organization" page you’ll see a blue button that says “Let SendTree Post to Twitter…" Click that button. You will be redirected to Twitter's set up page. 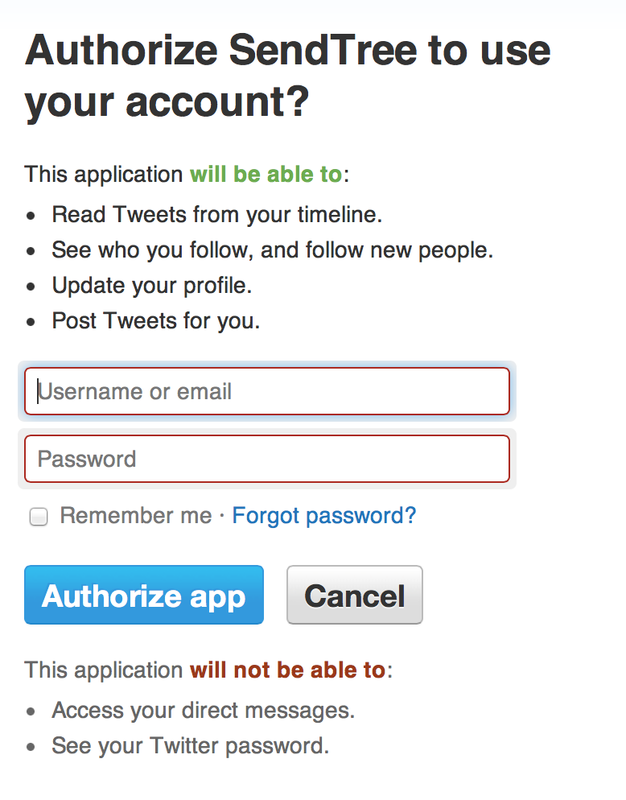 Enter your Twitter username and password and select “Authorize App”. 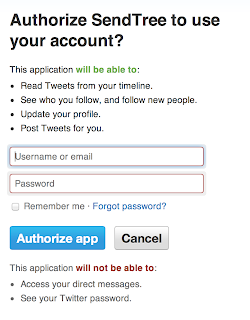 Log into Twitter and select "Authorize app"
If you ever need to edit who can view your Facebook or Twitter posts select the “My Account” tab and then “My Organization”. Just click the “change…” button beside either Facebook or Twitter to modify your lists.